Deep Purple History: Ian Gillan's home from 1971 until around 1983. 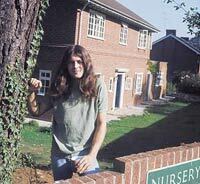 The Details: Seemingly newly built when Ian Gillan moved in (possibly in the grounds of an older property), Ian lived here throughout his time with Deep Purple and Gillan Band days, only moving shortly before the reunion. Today: The house is little changed externally, it is still a private residence. Thanks to Lorrainne Pickering for the recent pictures. (with a cup of tea) in 1971.